This is the second of the new Accurate Armour figures I picked up when I was down at Duxford on the 21st June, the first figure was Reviewed Here on Armorama. This will be a brief look at kit F25, which is another welcome addition to the genre. Accurate Armour figures come packed in a sturdy plastic bag, stapled to a backing card. On the front of the card are the company name and a description of the figure, on the reverse side are the company contact details. The figure is cast in a light cream resin, a small air bubble exists on the lower right hand trouser leg. There are some flaws with this figure which is a pity (see below). This is a simple figure consisting of 6 parts; the body cast as a whole, with the arms, head, cap and orders as separate items. There will be some pour stubs to remove from the feet, left arm and head with a little clean up required between the legs, so all the tools you should need would be a good sharp razor saw, X-acto blade and a board to smooth the cut ends. The figure depicts a standing British Officer wearing an officers cap. The left and right arms are designed so that the figure is holding a Baton tucked in under his right arm, and holding a set of orders in his left hand. Feet to collar he stands about 46/47mm in height. The Officer is dressed in 37/40 Battledress, complete with shirt and tie. This is a fair representation of the uniform, although the detail on the right hand hip pocket doesn’t exist and the detail on the large map pocket on the left leg is very poor/faint. There are nice folds and creases in the uniform and this figure should paint up nicely. To complete the uniform, the figure is wearing officers’ ammo boots and anklets. There was a small air bubble on the bottom of the right hand trouser leg as mentioned above. The Officer is wearing 37 pattern skeleton order, around the waist is a 37 pattern belt with a pistol holster on the left hand side, binocular case on the right hand side and above each a small ammo pouch. The detail on the brasses is fair, and the rear buckles are shown on the belt. Studs are present on the pouches and holster. The shoulder straps are there, but again like the left hand side pocket, detail is very faint. The head depicts the face of an older mature soldier. The detail is quite sharp and he wears a fine moustache. The officers’ cap comes as a separate item and will need some careful removal from the stub. The leather chin strap is present on the cap and two faint buttons can just be seen, although there is no cap badge present. The arms are quite well done, but again the cuff detail is poorly depicted. The right arm holding the Baton will also need careful removal from the stub. You get a thin rectangle of resin that I assume is the orders but I would just ditch that and use your own. As far as the pose is concerned, this chap could be a Senior Officer or Quartermaster type. It may not seem a particularly exciting pose, but I like it. I saw the figure with a Humber Box in the background and standing outside the vehicle he looks the part. The figure could also be used successfully as a Home Guard type or with a change of head as a younger Officer. It is always good to see more British/Commonwealth figures coming on to the market. Overall, this is a reasonably detailed figure. However, I was disappointed at the almost invisible left hand map pocket, and for some reason the rear hip pocket is missing, although there is what appears to be a small dip where it was meant to go. The general look of the uniform is good, the missing detail a bit annoying and the cuffs on the battledress not up to standard at all. The shoulder straps could have been much sharper, too, and the addition of a cap badge on the officer cap would have been welcome. It would have been nice to have the option of a different head, but as a Senior Officer I believe he fits the part. I am assuming he was also designed to go with the 1st figure WW2 British Officer with Helmet, that I purchased at the same time. Neither of these figures were shown on the Accurate Armour web site last time I looked, so perhaps I got a trial run example, and the errors will be fixed when these are available on line? After working with this figure for awhile I found the quality to be a bit higher than previously thought, hence raising the rating from 65% to 75%. 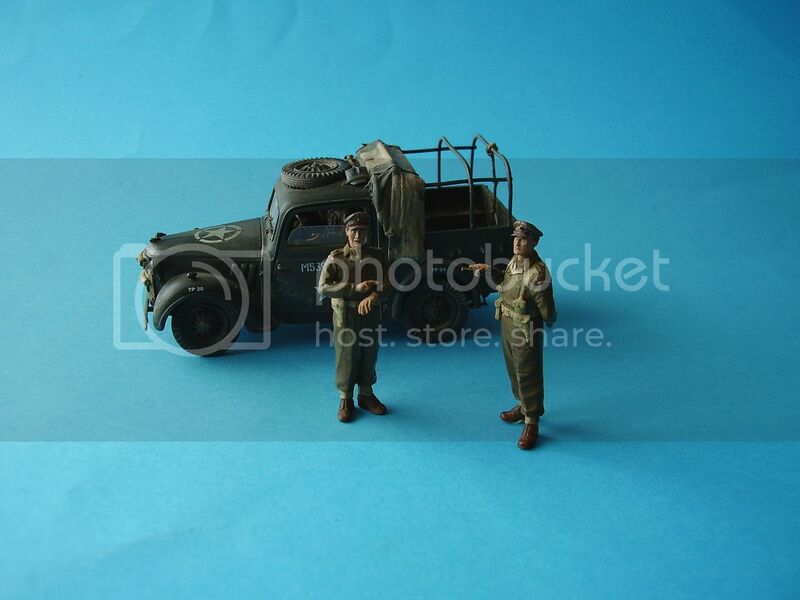 Highs: A useable figure, giving a fair representation of a Senior British/Commonwealth Army Officer. Lows: There was either a flaw in the casting or a slight slip in attention to detail. Faint and missing details spoil what could have been an excellent figure. Verdict: This one will need a bit of work to bring him up to scratch, but should still prove a very useful figure. Recommended, bearing in mind the above. Hey Al, A nice detailed review as usual. I was surprised to see that you only gave it a 65% approval, kinda low for anything from Accurate Armour. But as you said, perhaps it was a sample and there will be improvements or changes made to the future production runs of the figure. Cheers jjumbo p.s. Al, I finally managed to upload a new avatar using a picture of my Dad in uniform.